It's time to stop thinking about cocktails as something restricted to before dinner -- and think about the right drinks to have during dinner. To that end, the Halekulani offers a Spirited Dinner, hosted by Dale DeGroff, the resort's director of beverage arts, on April 28. The six-course meal pairs chef Daryl Fujita's Pacific fusion fare with DeGroff's cocktails. The menu: Kona Kampachi Ceviche (with Yuzu Vodka Gimlet), Creamy Artichoke Soup and Lump Crab Soufflé (with a Fino Sherry Adonis Cocktail) and Herb-Roasted Kobe Style Beef (with Blood and Sand Cocktail). A reception begins at 6:30 p.m. on the Garden Terrace lanai, to be followed by dinner at 7 p.m. Cost is $150. Call 931-5040. 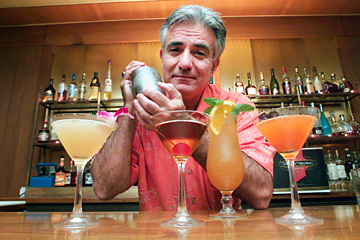 Dale DeGroff hosts a cocktail-pairing dinner at the Halekulani next week. "Two Skinny Chefs," with Chai Chaowasaree and Beth-An Nishijima, is morphing into one skinny chef next week. Chaowasaree goes it alone with the new show, "Dining Out with Chai," premiering at 5 p.m. next Sunday on KHON/Fox, replacing "Two Skinny Chefs." The chef-owner of Chai's Island Bistro and Singha Thai Cuisine will host the show, which will travel to cities such as New York, Las Vegas and San Francisco to explore the restaurant scene. Each episode will conclude with a cooking lesson in Chaowasaree's kitchen.